Good morning! So today I wanted to share exactly how it was that I went from having short brittle nails prone to breakage to having long nails perfect for nail art! I used to have short brittle nails that I couldn't grow out without breaking them or having them thin towards the ends so I was always trying new products that claimed to strengthen nails or help them grow. I have tried a few different products but these two are by far the most successful in actually achieving their claims for me personally. 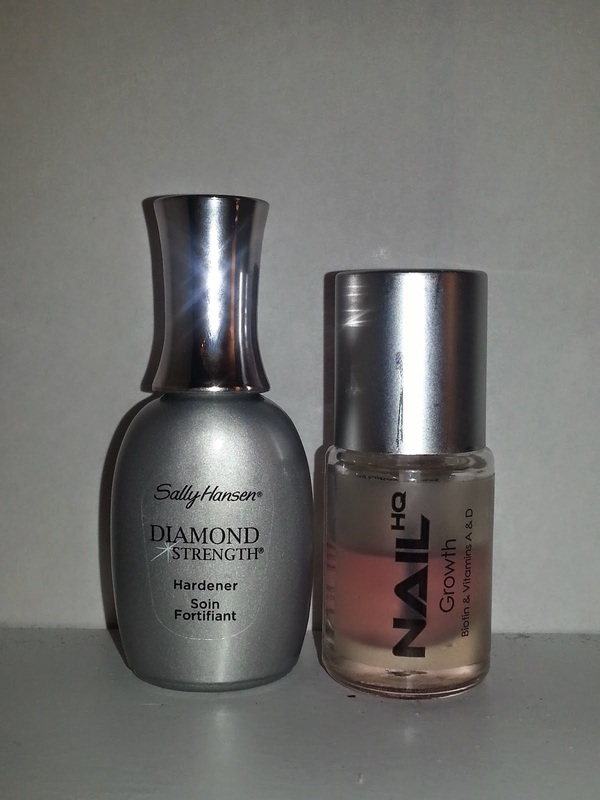 Sally Hansen Diamond Strength Hardener and Nail HQ Growth are the two weapons In my personal arsenal against weak nails. I apply both products before I do my nails, even if I don't have the time to do a manicure I make sure to apply at least these two products to keep my nails strong and protected. 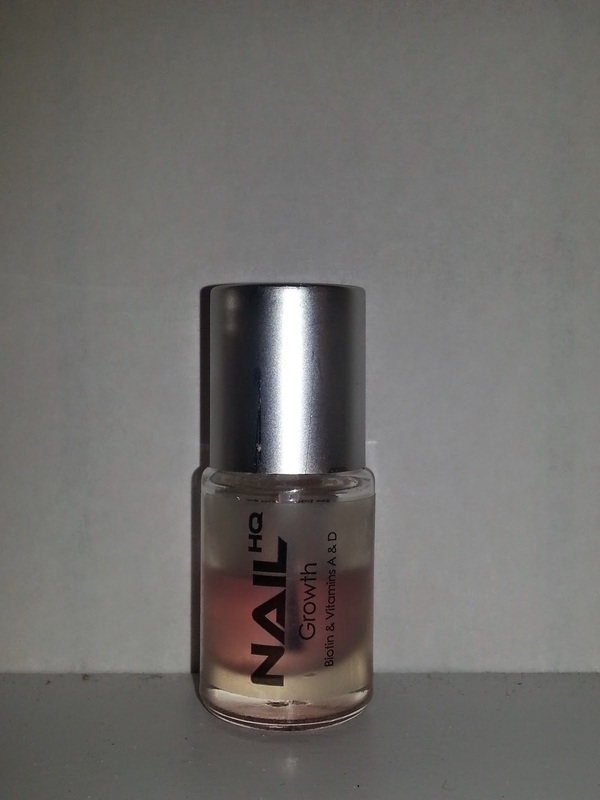 Nail HQ Growth contains Biotin which is essential in healthy hair, skin and nails as well as vitamins a&d which are also integral in maintaining strong healthy nails. First off I apply one thin coat of Nail HQ Growth and allow to dry completely. 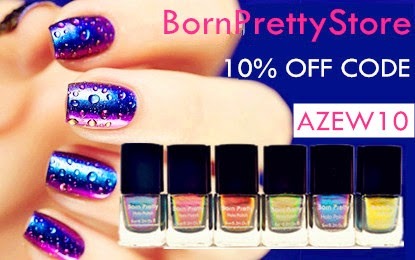 The product will dry glossy and clear on the nail despite its pinkish appearance in the bottle. When this coat has dried completely I move on to the next step. 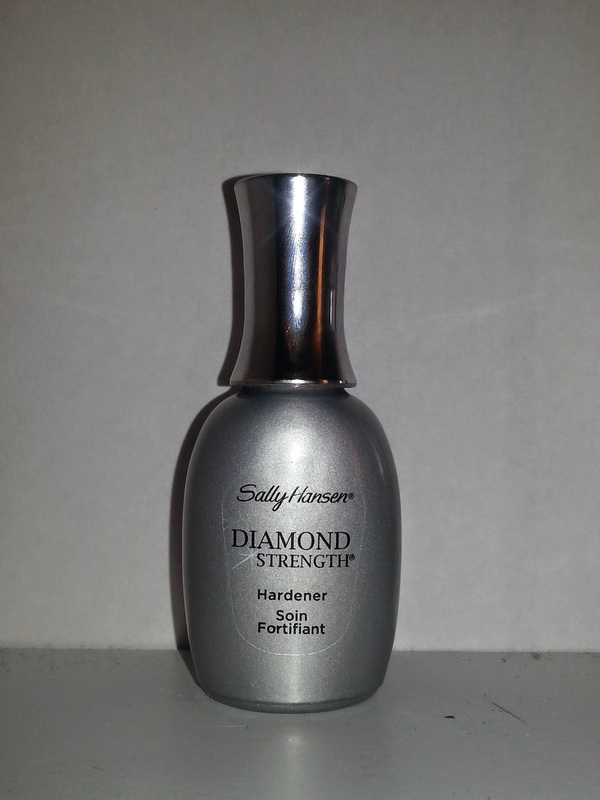 The second step in my nail preparation is applying an even coat of Sally Hansen Diamond Strength Hardener to all of my nails and letting them dry completely before moving on to any other steps in my manicure. This product is clear and adds a gloss to the nail as well. When thoroughly dry you can then move on to doing whatever lovely nail art you like. I do this every single time I remove old polish and begin a new. No one has nails that don't break occasionally but these products really have worked excellently for me to help growth and strength. Nail HQ Growth has helped me grow my nails out longer and stronger in record time, while Sally Hansen Diamond Strength Hardener reinforces them making them stronger and helping avoid breakage. I also want to add that in addition to applying these products I have always tried to avoid getting my hands and nails wet for an extended period of time. When nails get water logged frequently they become more brittle and prone to breakage. If I am doing anything with my hands that requires they be wet for long periods of time (dishes, washing the car etc) I will wear gloves to protect them. For the appearance of healthy nails and to make your nail art and manicures look even better it is also important to keep your cuticles in good shape. I often moisturize my hands paying extra attention to the cuticle area to make sure that the skin doesn't dry and peel and start to look a little on the nasty side. Well these are the products and tips that I use to help maintain my nails and I suggest that you try them. Of course the same thing doesn't always work for everyone but I do believe in these products and their effectiveness. Both products retail for $7-$10 and can be purchased wherever nail products are sold. I hope you enjoyed this post and that these tips work for you to! Thanks for reading!